I am slightly obsessed with a broccoli salad they make at my Whole Foods. It’s crunchy, sweet, and creamy all at the same time. Instead of going to Whole Foods daily to get some, I tried my own version. In this recipe, I steamed the broccoli, but next time I think I would leave it raw. My version didn’t have the same crunch, and I think it’s because I cooked the broccoli. I’ll let you know next time how it comes out. Chop the broccoli so the stems are removed and only small heads remain. They should be bite sized heads. Slice the bacon into small bite sized pieces. Saute the bacon over medium heat about 5 minutes. Chop the red onion into very small, fine pieces. Add the olive oil and red onion to the bacon and sauté another 3-4 minutes, until the red onion starts to soften. In a large bowl, add the broccoli, bacon, onion, and cherries. In a separate bowl, mix together the mayo, red wine vinegar, and thyme. Combine well. Pour the mayo mixture over the broccoli mixture and toss to combine. Looking for a side to go with Boyfriend Chicken this week, I noticed some broccoli in the fridge. I usually love simple roasted broccoli, but wanted to dress it up a little. So I made a Walnut and Shallot Dressing to add to the broccoli. Delicious! And you really could add it to any veggie for a little dressed up flavor. On a large cookie sheet, add the broccoli and salt and pepper. Roast at 375 degrees for about 20 minutes, until the edges start to crisp. 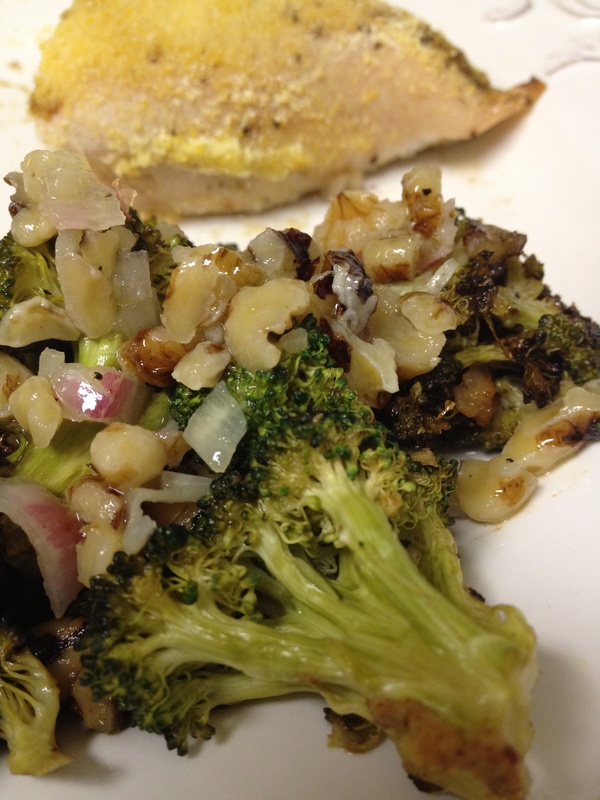 While the broccoli is cooking, combine the oil, vinegar, garlic, shallots, walnuts, and agave in a small bowl. 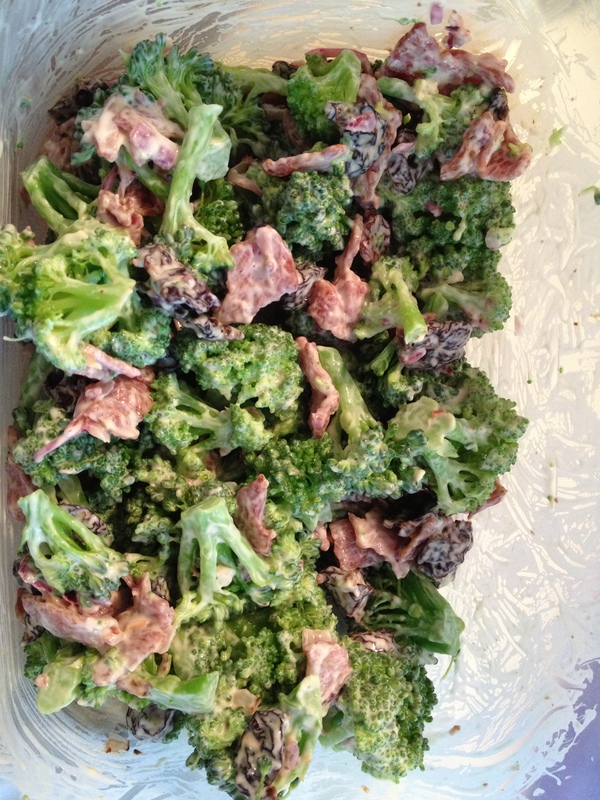 When the broccoli is done cooking, smother it with the dressing and toss to combine. Looking for simple dinners this week to ease back into the swing of things after the holiday, I baked a couple turkey breasts and wanted a smokey side to go with them. 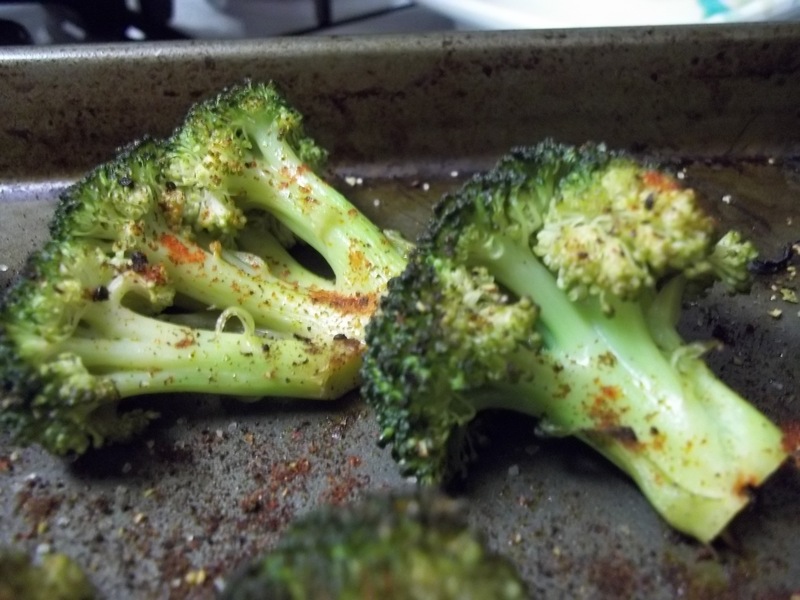 So I made Simple Roasted Broccoli, flavored with 4 spices. My smokey spice choices were a good combination with the turkey, and it was so easy to make! olive oil for misting/drizzling, about 1 tbsp. Cut the stems off of the broccoli so only the florets remain. Spread out the broccoli florets on a cookie sheet. Sprinkle the smoked sea salt, lemon pepper, smoked paprika, and chili powder over the florets. Bake at 375 degrees, about 20 minutes, until the florets start to brown and crisp.